In the first part of this series (here’s the link to Part I, on MikaelWrites.com – please read it before proceeding), I talked about the rather rocky start that Spidey had to endure in order to get his live action career up and web-swinging. Now, let’s take a look at how he successfully crawled out of Hollywood limbo to revitalize the superhero movie genre. After years in Hollywood limbo, the stars finally aligned, and the world soon witnessed the first of many big-screen exploits of the itsy-bitsy spider that would end up revitalizing an entire film genre. In 1999, the film rights to Spidey went to Columbia Pictures, which was under Sony Pictures Entertainment. The existing scripts by Cameron and company were revised and refined at different points in time by David Koepp, Scott Rosenberg and Alvin Sargent. It enjoyed a level of success that was unprecedented at the time, managing to be the only film during its time to rake in $100 million during its first weekend and over $800 million worldwide. Guess all those years of waiting really paid off, huh? Comic book painter Alex Ross pitched his own design for Spidey and Green Goblin’s movie costumes; however, these pitches were rejected. The most noteworthy elements of his Spidey movie concept were the predominant use of black, the exposed webshooters, and the large, bulbous eyes on the mask. 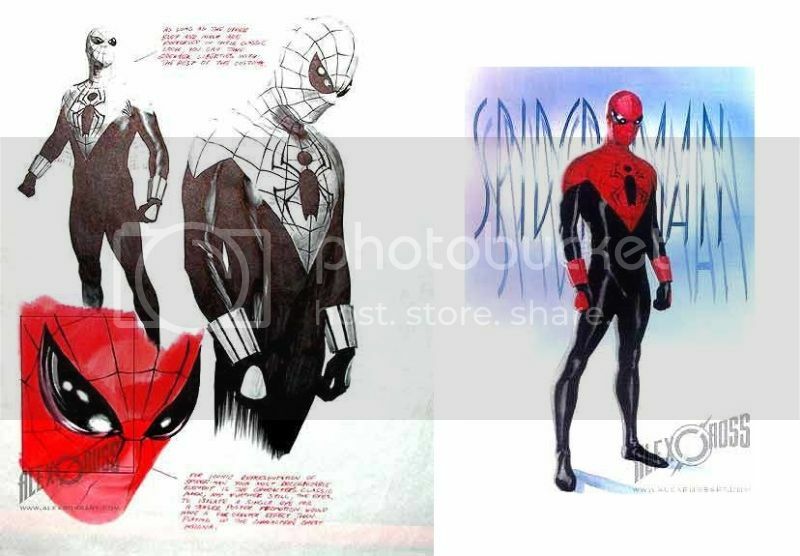 This concept would eventually be carried over into the comics, becoming the inspiration for two Spider-Man suits (an alternate version of Peter Parker who became a master assassin, and the second suit that Doctor Octopus designed when he swapped brains with Parker and tried to be a hero as the Superior Spider-Man). Remember, kids: Recycling is good! Unleashing a web of superheroic storytelling wonder upon an unsuspecting audience, Spider-Man premiered in the United States on May 3, 2002, starring Tobey Maguire as Peter Parker, Spider-Man. His costume did not draw inspiration from a single Spidey artist; instead, it kept all the classic elements, but put an all-new spin on the timeless suit. 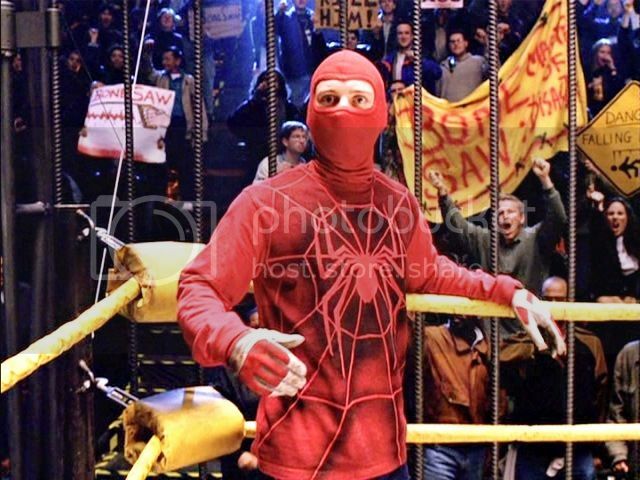 Tobey’s Spider-Man costume featured raised webbing detail, angular eyes, a stylized spider emblem, and a scale-like pattern all over it. Doing whatever a spider can, in style. The film also featured Parker in his proto-suit during his short-lived wrestling career. Instead of the web mask, white shirt, and jeans he wore in the comics, this version had him in an oversized sweatshirt and a red ski mask. Wait, you mean this ISN’T the audition for Snake Eyes in the new GI Joe movie? The film explored Spider-Man’s origin story, and featured Kirsten Dunst as his love interest, Mary Jane Watson. Willem Dafoe delivered a legitimately terrifying performance as the Green Goblin, while J. K. Simmons forever cemented his reputation in the eyes of comic book movie fans as the rage-spewing, perpetually-on-the-verge-of-a-heart-attack publisher of the Daily Bugle, J. Jonah Jameson. Check out the trailer below – it was pulled from theaters because it featured the Twin Towers prominently, and since this was around the same time the 9/11 attacks happened, Raimi and co. felt that it was inappropriate to continue using it to promote the film. Ask any geek for a rundown of their top comic book movies, and it’s highly likely that Spider-Man 2 would be on that list. In fact, many people consider it to be one of the best comic book movies ever (myself included). Widely regarded as the best among the films in the Raimi trilogy – and, for many, the best Spider-Man film so far, period – Spider-Man 2 opened in American theaters on June 30, 2004. The film grossed $783.8 million worldwide, and enjoyed positive reviews and critical acclaim from respected film writers. It even earned a perfect rating from beloved film connoisseur Roger Ebert himself. And I didn’t even have to fight a bear. Take that, Leo! Spider-Man 2 was an excellent mix of all the elements that made ol’ Spidey a well-loved comic book icon. 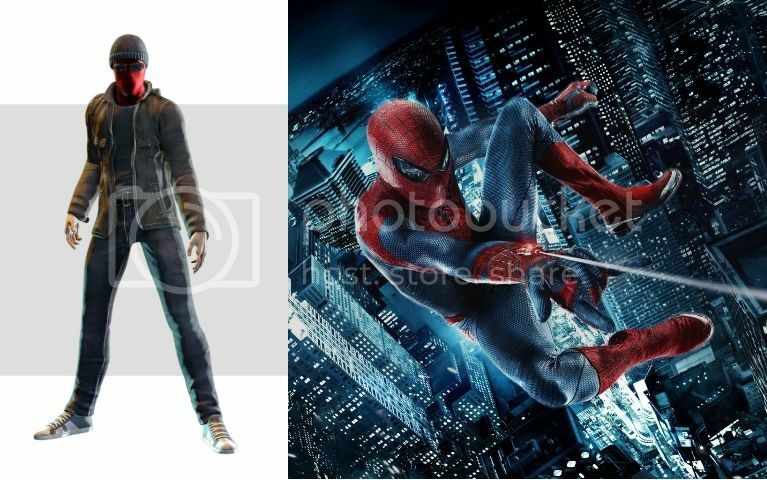 It demonstrated the dichotomy between his dual lives as timid Peter Parker and the thrill-seeking Spider-Man, as well as how his two “worlds” often clashed with one another. 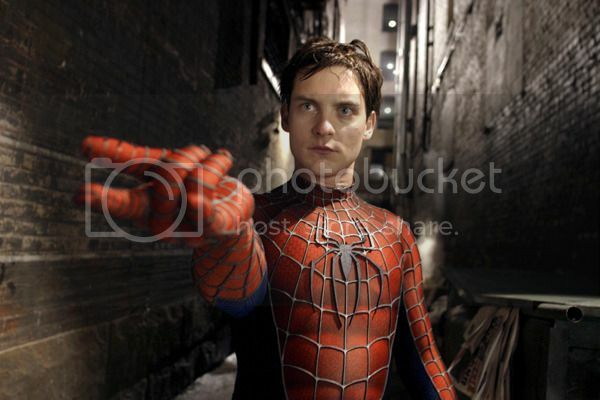 In this film, the odds were truly stacked against Peter; not only was Mary Jane, the love of his life, set to marry someone else – a direct consequence of Peter’s frequent absences in her life because of his duties as Spider-Man – but his best friend Harry (James Franco) also hated his webslinging alter ego, blaming Spider-Man for the death of his father. Add this to the emergence of a brilliant and formidable foe (Doctor Octopus, in a sympathetic yet sinister performance by the talented Alfred Molina) and the increasingly frequent malfunctioning of his spider-powers, and you wouldn’t be surprised to see this shot in the film – an almost perfect recreation of one of the most iconic scenes in Spider-Man’s history. Hint: It didn’t last long. Oh, and we also got this excellent sequence. I don’t think I’d be exaggerating if I said that, at the time, this battle scene truly set the bar for succeeding comic book film brawls. Unfortunately, at the height of Spider-Man’s cinematic success, the ol’ Parker luck reared its ugly head. To this day, Spider-Man 3 is believed by many to be the worst among all the Spider-Man films so far. It’s not as if it were at a disadvantage, though. One could even say that it had all the ingredients for a superhero blockbuster that could have been a fitting bookend to the trilogy. It had Venom, a vicious anti-hero that was one of the most commercially successful comic book characters of the ’90s; Sandman, a classic Spider-Man villain with visually stunning powers made possible on the silver screen by the best that technology had to offer at the time; Gwen Stacy, a beloved, tragic character in the Spider-mythos who was Peter Parker’s first true love; and the fan-favorite symbiote costume, which reached a level of popularity so high that it not only became Spidey’s main suit for a number of issues in the comics, but was also replicated in fabric, even functioning as his stealth uniform from time to time. It also inspired an entire wave of emo rock albums. Sadly, while any of these elements could have made this film spectacular, it was the inclusion of ALL of them that ultimately dragged this movie into the mud. 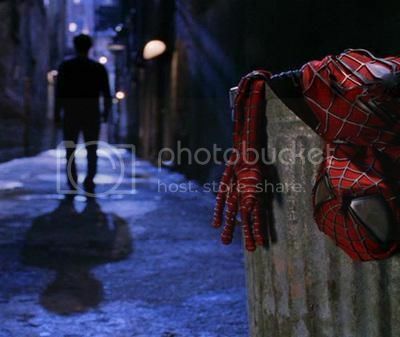 With a bloated and messy plot, underdeveloped characters, a baffling and pointless rewriting of established film continuity (Sandman, portrayed by Thomas Haden Church, was actually Uncle Ben’s killer), the extremely clumsy handling of the symbiote’s story arc (for some reason, the suit turned Peter into an angry teenager trapped in a grown man’s body, angst and awful fashion sense and all), and awful and unintentionally hilarious dance sequences, Spider-Man 3 was widely panned by critics, turning off even the most loyal fans due to the liberties it took with the source material. We would eventually learn, many years later, that Spider-Man 3 became a mess due to a combination of excessive interference from Sony’s executives and an effort to cram as many elements into the story as possible, against the will of Raimi himself. At the time, though, we were all just left scratching our heads (and trying our best to erase the image of Peter Parker’s crotch-thrusting from our minds). Nevertheless, the film grossed $890.9 million worldwide, making it the most successful of the Raimi Spider-Man films (and proving that ticket sales certainly aren’t the definitive measure of quality). Don’t believe me? Here, watch this, and good luck sleeping later. Despite its disappointing level of quality, Spider-Man 3‘s commercial success paved the way for Spider-Man 4. The original plan was to shoot Spider-Man 4 and 5 back-to-back. 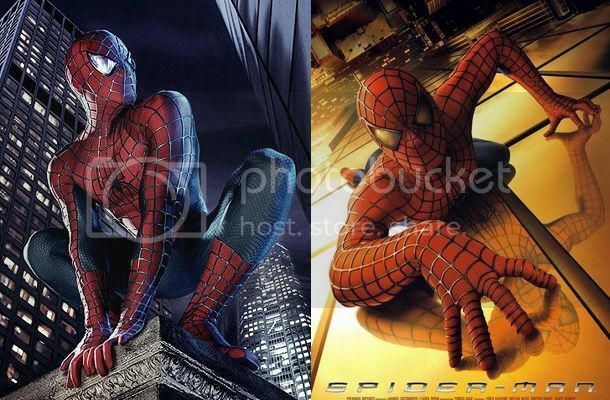 Eventually, it was decided that Spider-Man 4 would be developed first before Spider-Man 5 and 6, with the latter intended to be the continuation of the former. Ultimately, Raimi withdrew from the project, with Maguire, Dunst, and the rest of the cast following suit. This was perhaps for the best, as Spider-Man 4 seemed destined to become the exact same kind of train wreck Spider-Man 3 was, perhaps even worse. Spider-Man 4 was supposed to feature the Vulture AND the Vulturess (a different take on Felicia Hardy, the Black Cat), as well as a subplot involving Peter Parker cheating on Mary Jane with Felicia. The less said about this film, the better, I guess. It would take five years before audiences would see Spider-Man on the big screen once again. In the period of time since Spider-Man 3 all but killed the franchise, Marvel Studios had been quietly (and successfully) building its Cinematic Universe, elevating classic Marvel characters such as Iron Man, Captain America and Thor to celebrity status and essentially rewriting the rules of the superhero film genre. On the other side of the fence, Christopher Nolan was breaking records and winning the favor of critics and fans alike with the Dark Knight film trilogy, his modern, moody take on Batman. First announced in 2010, The Amazing Spider-Man featured an all-new cast and another take on the wall-crawler’s origin story. 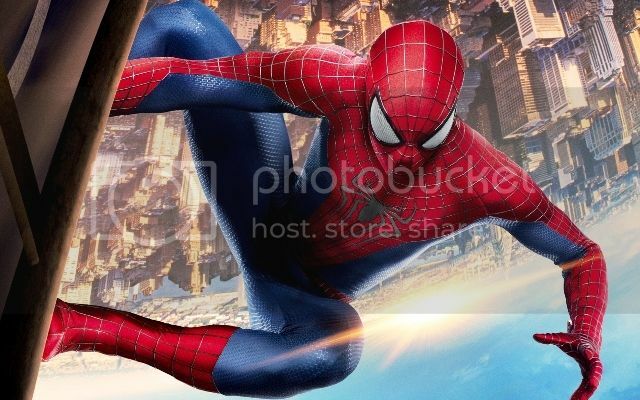 Initially marketed as a film that would fill the gap between the films in the Raimi trilogy – in fact, the slogan “The Untold Story” was heavily used in early promotional materials – The Amazing Spider-Man eventually became a full-fledged reboot, with British actor Andrew Garfield donning the webs. Garfield was cast alongside Emma Stone, who portrayed Gwen Stacy. In this film, Spider-Man found himself up against two major villains – the Lizard (played by Rhys Ifans) and terrible fashion choices. On the left: Spider-Mugger. On the right: Spider-Basketball. Directed by the rather appropriately named Marc Webb, The Amazing Spider-Man was released on July 3, 2012, and was met with mixed to positive reviews. Critics particularly praised the on-screen chemistry between Garfield and Stone (who would soon fall in love and become a real-life couple, in a relationship that reportedly lasted until a few years after the sequel). The Amazing Spider-Man‘s commercial success was enough for Sony to greenlight the sequel, and soon, The Amazing Spider-Man 2 began development. Intended to be the launchpad for Spider-Man’s own cinematic universe (a model that Sony was desperately trying to copy from Marvel, after the studio’s record-shattering superhero extravaganza, The Avengers), The Amazing Spider-Man 2 fell prey to the same factors that caused Spider-Man 3 to become a critical crash-and-burn, and then some. On the bright side, The Amazing Spider-Man 2 gave us what is arguably the best take on the classic costume to date (yes, even counting the MCU version, which we’ll get to in a bit). The only thing wrong about this suit is that it’s never going to get used in a Spider-Man movie again. The Amazing Spider-Man 2 did so many things at once. It tried to introduce the Sinister Six in order to set up a potential spin-off film. It featured Harry Osborn (Dane DeHaan) becoming the Green Goblin, something we had already seen in Spider-Man 3, but somehow made worse because (1) he was just introduced in this film and (2) he was the first Goblin in this continuity, and not his father Norman (played by Chris Cooper). It featured too many villains: Jamie Foxx’s jittery and unstable Electro, Paul Giamatti’s bumbling Rhino – whose big fight with Spidey wasn’t even shown in its entirety – and the aforementioned Harry-Goblin. 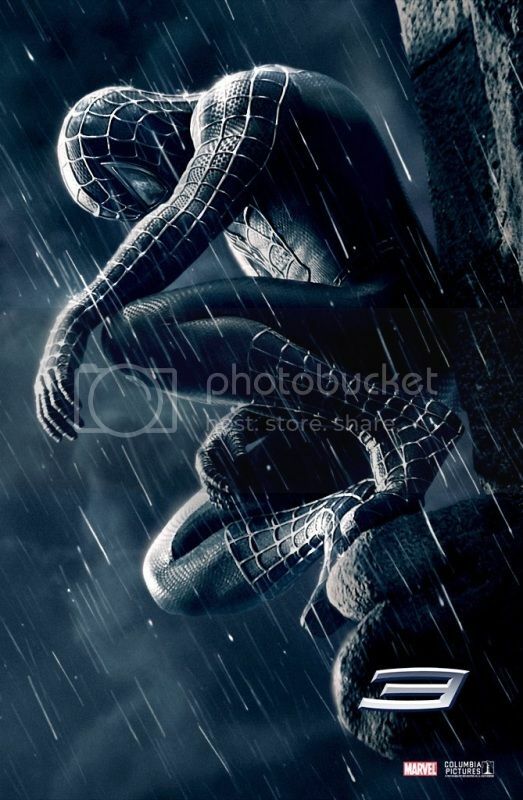 Lastly, in a bittersweet move, it killed off Gwen Stacy, simultaneously giving us a truly heartbreaking scene (good) and eliminating one of the few outstanding aspects of the franchise so early in its lifetime (very bad). If it looks like he’s trying to impale himself on the horn, well, can you blame him? Soon, the inevitable happened, and plans for The Amazing Spider-Man 3 – as well as the long list of Spider-spinoffs that Sony was planning for the franchise – were scrapped. The “hey, everyone” that was heard ’round the world. 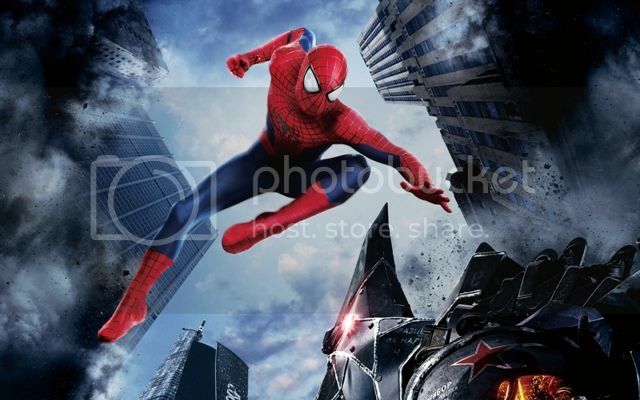 On February 9, 2015, Marvel Studios and Sony Pictures confirmed that they had reached an agreement – Spider-Man was headed for the Marvel Cinematic Universe. Set to appear in Captain America: Civil War, the Marvel Cinematic Universe’s version of Spider-Man was confirmed to be portrayed by Tom Holland, after a long, rigorous, and secretive audition process. Marvel wanted Captain America: Civil War‘s directors, Joe and Anthony Russo, to prepare for the possibility of Spidey being ultimately excluded from the final film, even going so far as to tell them to come up with a “Plan B” in case the deal with Sony didn’t materialize. The Russo brothers, however, knew their priorities, and knew what they wanted. 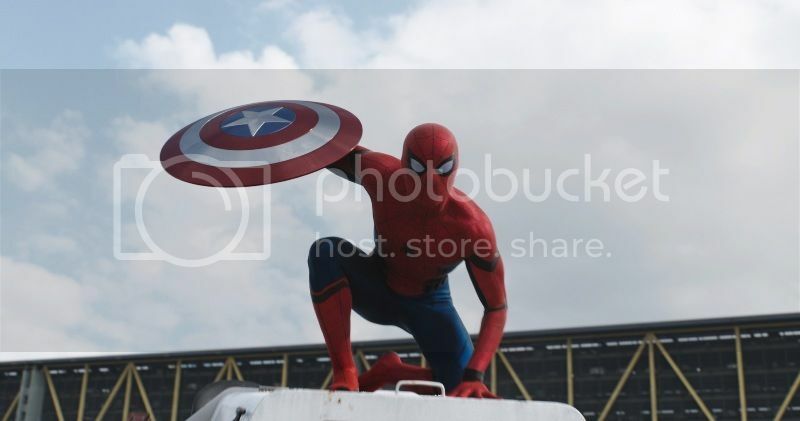 They strongly believed that Spider-Man was a crucial part of the film, and did not even want to entertain the idea of completing Captain America: Civil War without him. “We only have envisioned the movie with Spider-Man,” they said. Thus, when Spider-Man made his surprise debut in a Captain America: Civil War trailer, the Internet lost its collective mind. 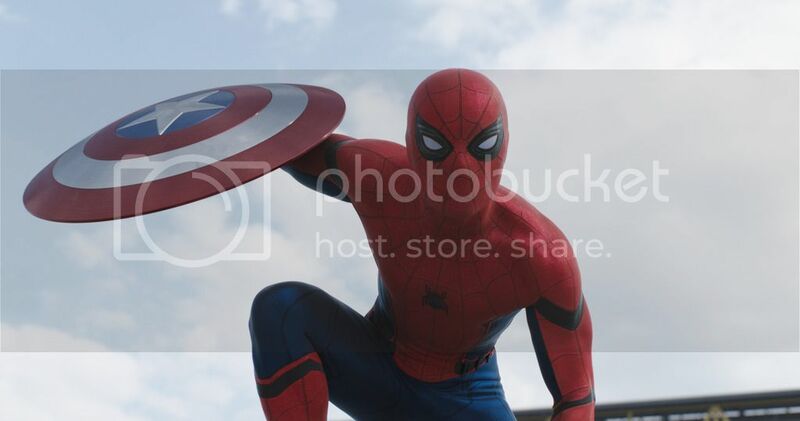 Captain America: Civil War received positive reviews, and critics praised Tom Holland’s funny, youthful take on the wall-crawler. A protege of Tony Stark in this continuity, Spider-Man lent a hand to Team Iron Man in the film’s epic hero-vs-hero brawl. Here, he rocks a technologically enhanced costume that closely resembles the classic design, but also has a few design tweaks to better match the general aesthetic of the Marvel Cinematic Universe. Luckily for us fans, we’ll see Tom Holland’s Spider-Man in his first solo film very soon, as Spider-Man: Homecoming is scheduled to hit theaters on July 7, 2017. Planning to skip Spider-Man: Homecoming, you say? Yep, he’s silently judging you.